Until comparatively recently, I thought the Middle Ages were dull. The highest level conceptual framework in my understanding of European history looked roughly like this: Classical Antiquity, Dark Ages, Modernity. I was certainly interested in the causes of the end of classical civilisation and of the development of our modern civilisation, but what happened between, say, AD 500 and AD 1500 seemed like so much interminably complex but rather dull noise compared with contemporary developments in the Byzantine Empire and Islamic civilisation. Then I made the mistake of using the term “Dark Ages” in a conversation with my friend Sara, an erstwhile historian of the Middle Ages, and soon found that I’d been entirely wrong: they were a time of substantial social, political, economic and technological innovation. 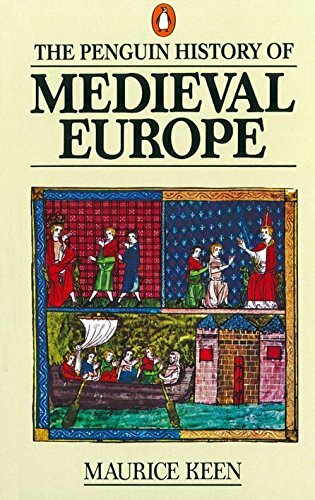 It was that conversation that lead me to read Maurice Keen’s A History of Medieval Europe (now published as The Penguin History of Medieval Europe). The period covered by the book is not the whole of the Middle Ages. Instead, it begins with the reign of Charlemagne and ends with a ten year period that saw the dissolution of the Council of Basle, the fall of Constantinople to the Ottoman Turks, and the French victory over the English at Chastillon. Keen subdivides this span into four phases: 800-1046, during which the idea of empire was revived in the West; 1046-1216, the first part of the struggle of the empire and papacy that left the Church seemingly triumphant; 1216-1330, the period of decline of the Roman church; and 1330-1460, during which the idea of the unity of Christendom passed away. This periodisation covers the time during which the compass of European civilisation was neither “the Roman Empire” nor a “great republic of Europe”, but “Christendom”, a region united by the authority of the Church of Rome. Keen traces many threads across each of these periods. One of the central themes is the struggle of the Holy Roman Empire and the Catholic Church, each of which had a claim on supreme authority in Christendom. On the secular side, he follows the development of feudalism, the growth of urbanisation and trade, changes in political ideals and forms of government, the decline of individualism and the growth of national feelings (especially in England and France). On the religious side, he is concerned with the effects of the emergence of new ideas in philosophy and the growth of universities on faith, the unrest in the Church that resulted in the Great Schism, and the struggles between general councils and the papacy for the ultimate religious authority. Keen also describes the changing relationship between Christendom and its Islamic neighbours, spending considerable time on both the Crusades and the advances of the Ottoman Turks into Europe. The book ends with the end of the Hundred Years War. This series of linked conflicts began as a dynastic struggle within the feudal realms of the kings of England and France (the king of England was also the duke of Gascony, and in that capacity a vassal of the French king). It soon expanded into a complex tangle of wars across Europe, driven by the glut of mercenaries and “free companies” for whom continued warfare was a necessity. In its last stages, it had evolved into a war between two nation-states on more modern lines. The Hundred Years War thus saw the shift from a civilisation in which Christendom was the umbrella within which a web of complex fuedal relationships operated, to one in which the paramount political entities were individual, sovereign, territorial nation-states. It was the conflict in which our modern notion of Europe was forged. This is all very interesting stuff. It is also, needless to say, too much for a single three hundred page book to cover in detail. Indeed, the Middle Ages were so rich and complex that I barely feel qualified to comment upon them. Nevertheless, Keen’s account is probably as good a starting point as any for their study. Oh *yes*, medieval Europe was an interesting place. I recently heard a suggestion that to put it in the terms people thought in at the time, there was a battle between Good vs Evil just after the Black Death, and as they were defined then, Evil won. Unfortunately that suggestion wasn't then argued very well, I feel like maybe, if I could ever be bothered, the idea could be fleshed out better. If you look closer at English history for that time, especially the second half of the age, you can see a lot of the bases for the current concept of British parliamentary democracy being laid. Interestingly enough, not generally because of a high-minded ideal somebody picked up from reading Ancient Greek texts, but to curb specific behaviours of specific monarchs and nobles. i want to know why is the term ''dark ages'' an inaccurate way to describe europe during medieval times??? can you answer my question before the first day of november..